To maintain good health, many individuals turn to the use of supplements. When taken in the correct dosage, bee pollen may be able to provide a number of important health benefits. According to WebMD, there currently is not enough information available to make a clear recommendation when it comes to standard dosage for bee pollen, in either tablet, powder, or granular form. WebMD does note, however, that bee pollen is possibly safe for use when taken twice daily for up to two months, in a formula that contains 6 mg of royal jelly, 36 mg of bee pollen extract, bee pollen, and 120 mg of pistil extract. Individuals who are interested in taking bee pollen in tablet form, then, should look for a product that contains bee pollen in these ratios. Adults who prefer the use of bee pollen powder or granules may start by taking 1/8- to a 1/4-teaspoon per day, and gradually increase their consumption up to a total of six teaspoons per day, notes WebMD. As with the other forms of bee pollen, this is not a recommendation for standard dosage, but rather an amount that has been deemed possibly safe for use by adults. Similar in nature to a multivitamin, bee pollen that is in tablet form may be the easiest to take, reports Pollen Natural Energy, but that doesn't necessarily mean that it is the best. In fact, bee pollen tablets often contain solidifying ingredients to maintain their shape, which can affect rates of absorption and potential nutritional benefits. In general, bee pollen powder is added to juice, smoothies, or other beverages for consumption, though some individuals may be willing to simply consume the powder straight. 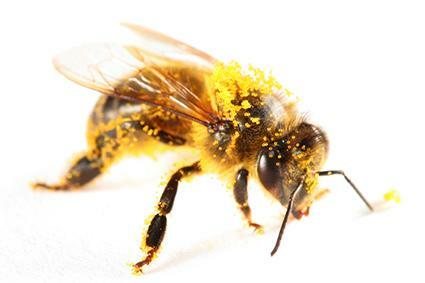 Similarly, bee pollen powder can be encapsulated, and taken in tablet form. According to Pollen Natural Energy, bee pollen powder generally does not contain artificial ingredients, and is absorbed quickly into the bloodstream. Its long shelf-life also is a plus when choosing between different types of bee pollen. Bee pollen granules are composed of bee pollen that has been encased within husks. Pollen Natural Energy notes that as with bee pollen tablets, granules can be difficult to digest and absorb, and have a relatively short shelf-life that may decrease their effectiveness over time. Since there are no clear recommendations when it comes to identifying how much bee pollen is ideal, individuals who are interested in incorporating this supplement should talk with their healthcare provider before adding it to their diet. While many adults may be able to take bee pollen in the dosages described above with little difficult, others may not be so lucky. In fact, individuals who suffer from asthma, blood disorders, or liver disease are cautioned against the use of bee pollen, note Marcia Nelms, Kathryn Sucher, and Sara Long in Nutrition Therapy and Pathophysiology (page 643). Nelms, Sucher and Long note that pregnant women, children, and those who have experienced the symptoms of an allergic reaction after exposure to bees or bee products in the past should also avoid bee pollen. When taking bee pollen granules or powder, start with 1/8- to 1/4-teaspoon per day, and work your way up to a total of 6 teaspoons. Your healthcare provider can provide more specific recommendations when it comes to identifying how much bee pollen is safe - and appropriate - based on your individual health history.